“My husband and I would have totally crumbled if the support hadn’t been there,” says Lynn Luloff, chief financial officer of Winneshiek Medical Center in Decorah, Iowa. 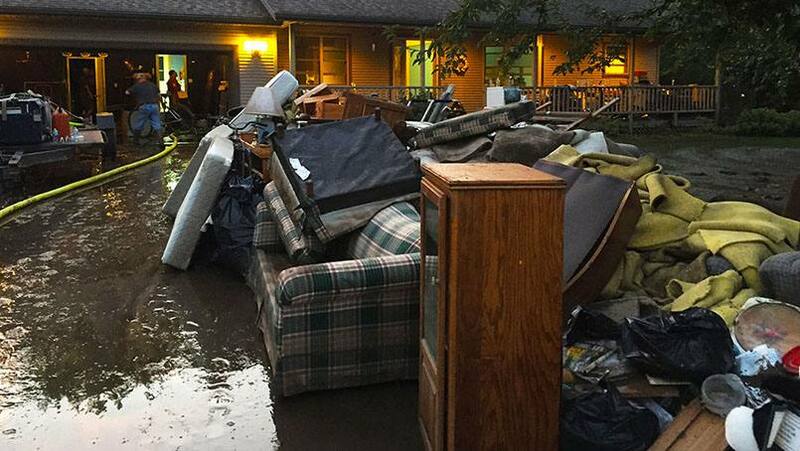 Luloff is one of many Mayo Clinic Health System staff who work at the Decorah medical center who saw their daily routines washed away the morning of Wednesday, Aug. 24, when 8 to 10 inches of rain led to major flooding in the area. Mayo Clinic Health System provides physician services and management services at Winneshiek Medical Center. The crisis, according to leaders at the medical center, revealed an unwavering commitment by health system staff not only to serve patients, but also each other. It turns out that Luloff’s decision to drive into work around 3 a.m. that morning, if only to get one of her family cars to higher ground, proved to be a key decision in the way her day played out. An hour later, water started rushing into her home, and her husband was stranded. That’s when Luloff’s work community jumped into action. A friend and retired medical center accountant rescued Luloff’s husband with a canoe, capsizing twice in the process. Returning to the house was unthinkable, with 5 feet of water on the main floor. “When you can’t get into your house, you might as well go to work,” says Luloff, who then proceeded to prepare for that day’s Finance Committee meeting with another board member whose house also suffered flood damage. By Friday, the water had receded, only to be replaced by a flood of co-workers offering to support one of their own in a time of need. Luloff says about 50 medical center colleagues teamed up nearly around the clock to help salvage what was left of the Luloff home. “It’s just been phenomenal. It really helps you get through a crisis like this,” she says. Teamwork was also top of mind for Andy Goodner, M.D., Family Medicine. His calendar served up a full slate of patients the day of the flood, and he wasn’t going to let the rising waters of the Upper Iowa River keep him from getting to work. That wasn’t the end of his ordeal, however, as he says he came upon another flooded road. He ended up hitching a ride with an old high school classmate, whom he found sandbagging. By 10 a.m., Dr. Goodner was at the medical center, ready to see his patients. “Staff have stepped up and, thankfully, we have had a good outcome,” says David Rooney, who is the operations administrator at Winneshiek County Memorial Hospital. The ambulance crew worked with the Decorah Fire Department to get a special vehicle to reach a patient in critical condition at his home. Half a dozen paramedics stayed up all night assisting firefighters and other emergency responders and still reported for work the next day. A wall of mud caved in a trustee’s basement wall. He still came to the finance committee meeting that day. Plans were made to shelter dozens of residents from a nearby nursing home, when rising waters threatened the facility. Luckily, an evacuation was not necessary. Maintenance staff shut down chillers and other equipment in the medical center to conserve water, as the water treatment facility in Freeport was at capacity. “The support we have received from near and far has been incredible,” says Rooney. Colleagues and Mayo leadership from across the region, including La Crosse and Rochester, have reached out to offer assistance and resources. “That’s the spirit of Mayo Clinic,” he adds.